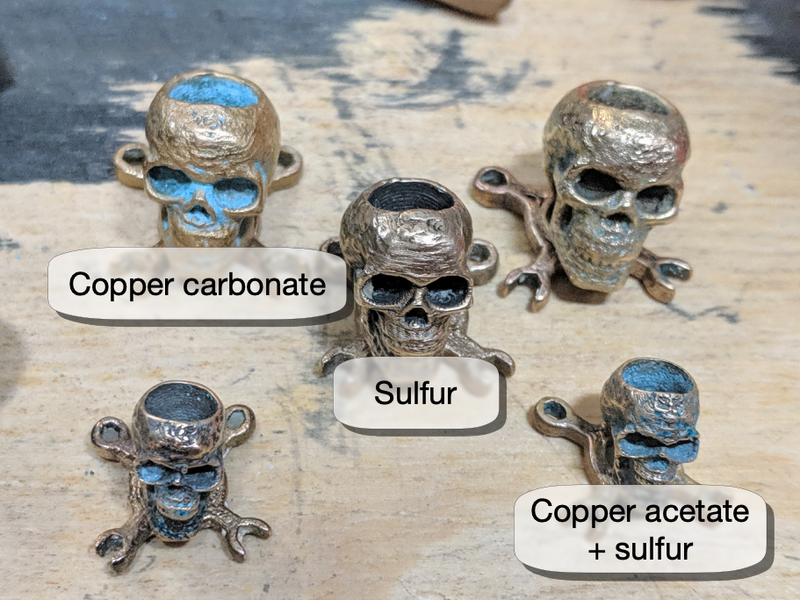 There are a few common ways to age or force "natural" patina onto bronze and copper alloys. The verdigris can form spontaneously just from cleaning, and will "stick" best to very clean (polished) bronze. They can be prevented with light waxing, and can wipe off with a soft cloth. 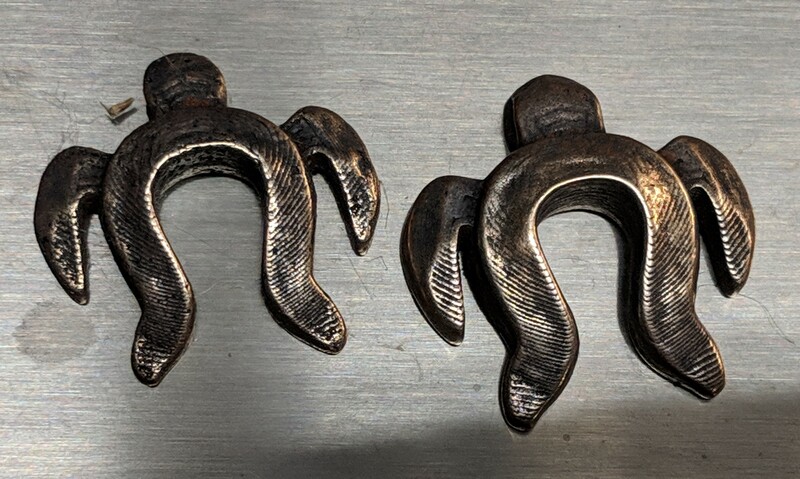 The darker color, as an "oil-rubbed bronze" finish, is an integral part of the surface material and can only be removed with aggressive wire brushing, sanding, or other surface removal. For the chemical bath processes, the bronze must be VERY clean: vinegar or ammonia bathing works well. Don't touch the pieces with bare hands, the transferred oils can affect the outcome. It is a fragile crystal, generally formed from ammonia + baking soda solution -- or you can cheat and use Brasso. Apply the solution, leave it for a few minutes. Brasso is a nice shortcut here: it cleans the surfaces, then if you not-too-carefully wipe it down and leave some in the crevices, bright green patina will form. Unfortunately it's a very fragile crystal, so be prepared to apply wax or enamel to protect it. Darker, more robust patina is formed with a vaporized vinegar and salt mix. Lots of different techniques for doing this, but I've found it easiest to make a little table, put that inside a plastic container, and put an inch or two of vinegar + rock salt in the bottom. Leave it open, to let the vinegar evaporate and mix with oxygen on the part. Clean parts will turn green pretty quickly. The crystals tend to be larger than copper carbonate, much darker in color, and not quite as easily removed. They are pretty fragile, though, so again be prepared to enamel or wax over the finish. Black / brown: ?? some sort of copper sulfide? I'm still trying to figure out the chemistry on this one. There are two ways to make an "oil-rubbed bronze" style finish, but note that "oil-rubbed bronze" is really just paint with glitter, and not really a thing done to actual bronze. There are two ways to make it. The finish is VERY durable, and can only be removed along with surface material: sanding or brushing (to remove a layer of material) works great. Wiping, cleaning don't do anything. Pickling (acetic acid bath) removes some of it, but not all. VF's "magic black powder" (MBP) appears to be a very fine blend of gypsum and charcoal. I asked, they neither answered nor denied, but the SDS basically says "it's gypsum and charcoal" and it behaves a lot like those two things, so... gypsum + charcoal. 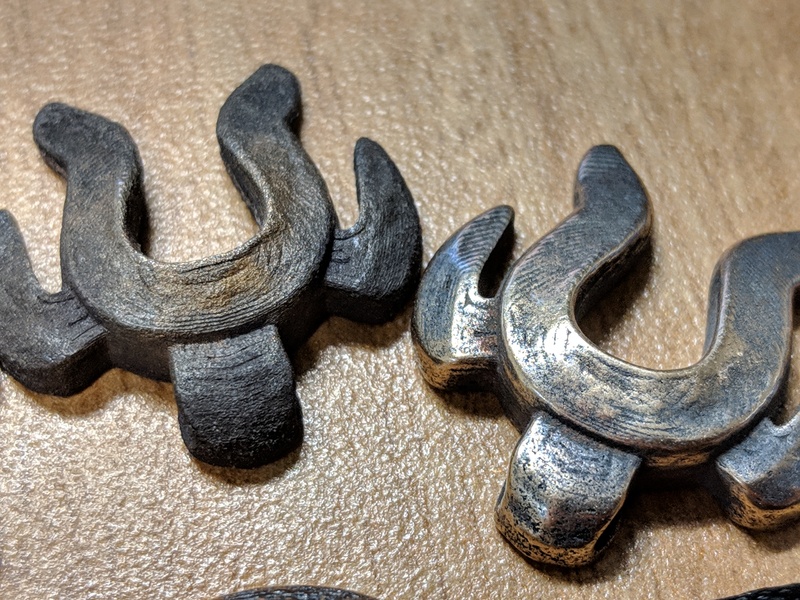 The MBP doesn't make a very good refractory for the sintering process -- it traps too much of the burned-off PLA -- but the gypsum DOES provide a really good source of sulfur, and during the sinter we get a LOT of heat right up against the virgin bronze, for a very very very durable finish. My current method: dust the green parts with MBP (like, pack it on then lightly brush it back off) to get the surface covered well, then pack it in mullite with a top layer of charcoal. This gives a good balance of "sulfate the bronze" without givng the surface problems of "too much MBP" / "binder got stuck". Downside: this is done mid-process, so any polishing / shaping will remove the coloration. Simple polishing will not significantly interfere. Hard to "aim" the process (MBP kinda gets everywhere), but not terribly difficult to clean as needed. I need to try this. Articles mention using the yolk of fresh, boiled eggs. That sulfury smell of "rotten eggs" is actually sulfur, and can be applied to bronze in "minutes" to get the darkening effect. A sulfur-based acid (via liver of sulfur) can be applied to very quickly react with the surface and provide a darkening / browning of the material. It's applied as a liquid, and can be brushed on (accurate) or bathed (total dunking, but easier to dial in the color change). The solution is apparently pretty nasty: acidic and forms some nasty hydrogen sulfide gas. Do it outside, use gloves and PPE, and keep baking soda on hand to stop the reaction *and* to neutralize the solution when finished.